Vitrectomy is a surgical procedure undertaken by a specialist where the vitreous humor gel that fills the eye cavity is removed to provide better access to the retina. This allows for a variety of repairs, including the removal of scar tissue, laser repair of retinal detachments and treatment of macular holes. Once surgery is complete, saline, a gas bubble or silicone oil may be injected into the vitreous gel to help hold the retina in position. The vitreous or vitreous humor is thought to serve as a framework or support for the layers of a newborn’s eye during development. In normal eyes, the vitreous is crystal clear throughout adulthood and fills the eye from the front or anterior (iris-lens) to the back or posterior (optic nerve). This area comprises two-thirds of the volume of the eye and is called vitreous cavity, which along with the retina, the retinal pigment epithelium, choroid, and sclera, make up the posterior segment. A vitrectomy performed for diseases of the posterior segment is called a posterior or pars plana vitrectomy. This kind of vitrectomy is performed by a retina specialist. Because leaking vitreous gel can lead to future problems, an anterior vitrectomy may be performed to minimize risk and to promote visual recovery. Almost all ophthalmologists have received eye surgery training in their residency and can perform an anterior vitrectomy. The retina surgeon chooses the best equipment to use in each case from a wide variety of vitrectomy instrumentation. Since the first vitrectomies were performed in the 1970s, the trend has been toward smaller and thinner microsurgical equipment. Many vitrectomy procedures can now be performed with self-sealing, sutureless (no-stitch) incisions approximately one half of a millimeter in size, which is about the width of an eyelash. Although it has some limitations, small-gauge vitrectomy surgery is generally considered more comfortable than surgery with larger instruments and offers faster visual recovery in many cases. Unless the patient is in poor health or has severe disease, nearly all vitrectomies are outpatient procedures performed either in a hospital or in a dedicated ambulatory surgery center; they involve little or no pain and require only minimal anesthesia. An IV, EKG, blood pressure, and oxygen sensors are in place to monitor the patient’s vital signs and health. In the operating room, a formal time-out procedure is used as a safety measure. This procedure verifies that the team has the correct patient, procedure to be performed, and eye to be operated on. The information is confirmed by surgical, nursing, and anesthesia staff. The eye is anesthetized (numbed) so the patient is comfortable during the procedure. IV sedation (commonly called twilight sleep), or in rare cases general anesthesia, may be used for additional relaxation. The eye is prepared with antiseptic solution and a sterile drape is applied. An eyelid speculum is used to keep the operative eye open. The other eye is covered and protected. Patients generally close their non-operative eye and rest during the surgery. Typically, the dilated eye is entered through the pars plana, a “safe zone” in the white part of the eye or sclera; hence this procedure is called a pars plana vitrectomy. A surgical microscope with a special lens allows a wide view of the inside of the eye as well as a magnified and detailed view. (Figure 1). The surgeon uses a vitrectomy probe (vitrector) to cut and delicately remove the gel-like vitreous. Figure 1. 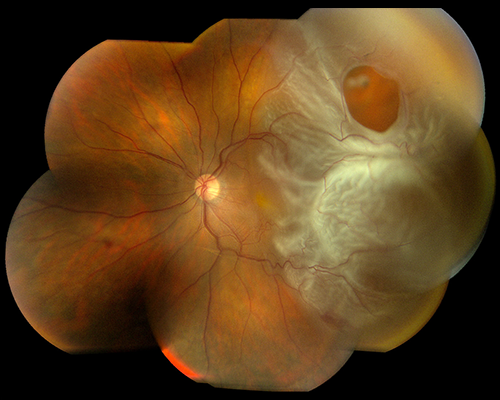 A wide-angle image of the retina following successful retinal detachment surgery by vitrectomy, scleral buckle, laser, and a small gas bubble. Image courtesy of the ©ASRS Retina Image Bank, contributed by Sharon Fekrat, MD, FACS. Image 3402. Figure 2. Vitreous hemorrhage, pre-retinal, and sub-retinal hemorrhages block vision and are indications for vitrectomy. When blood is cleared by surgery, vision will improve, but improvement is limited by the underlying health of the retina. Image courtesy of the ©ASRS Retina Image Bank, contributed by contributed by Thomas Ciulla, MD, MBA. Image 18973. The eye is left filled with sterile saline (salt water) or with a vitreous substitute such as a gas bubble or silicone oil. When a vitreous substitute is used, a period of post-operative positioning (typically face-down) by the patient helps the retina heal. Complications of surgery are rare, but include infection, bleeding, high or low eye pressure, cataract, retinal detachment, and loss of vision. Very few conditions are cured by vitrectomy alone. Most vitrectomies have at least one additional associated procedure. For example, a patient with longstanding diabetes develops sudden painless loss of vision that has not gotten better with observation alone. Bleeding in the vitreous, a vitreous hemorrhage, is diagnosed. A pars plana vitrectomy removes the hemorrhage and restores vision. However, if the cause of the bleeding is not addressed, vitreous hemorrhage is likely to recur. 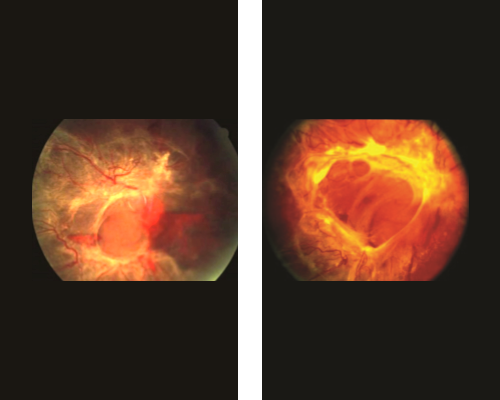 Adding endolaser treatment to the vitrectomy surgery treats both the vitreous hemorrhage and areas of diabetic retinopathy—and the patient is much more likely to have an excellent long-term result. When is a Vitrectomy Recommended? When the vitreous cavity becomes cloudy, patients experience hazy vision. If the haziness is caused by benign (mild) or inactive conditions such as asteroid hyalosis, posterior vitreous detachment, vitreous hemorrhage, vitreous condensation, or old inflammation, a complete pars plana vitrectomy may resolve symptoms and permanently improve vision. The decision to perform surgery is typically based on the severity of the patient’s symptoms compared to the uncommon but measurable risks of vitrectomy surgery. This indication is the most straightforward of the 5 categories. Treatment consists of vitrectomy to remove vitreous opacities (clouding), separation of the vitreous from the retina, membrane peeling to remove retinal traction, and placement of a gas bubble or laser as needed to prevent recurrence. Removing membranes or scar tissue from the surface of the retina is delicate and exacting work, requiring many techniques in addition to vitrectomy. Figure 3a. 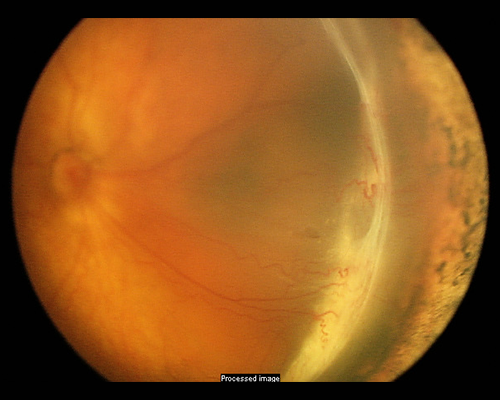 Vitreous fluid flows through a retinal tear to cause a partial retinal detachment involving the macula. The optic nerve and nasal retina, or portion of the retina closest to the nose, are normal and uninvolved. Vitrectomy surgery is indicated to restore vision. Image courtesy of the ©ASRS Retina Image Bank, contributed by Brandon Busbee, MD. Image 2939. Figure 3b. An epiretinal membrane wrinkles the surface of the retina and blocks the macular photoreceptors (light-sensing cells at the center of the retina). This causes blurry and distorted vision. Vitrectomy and retinal membrane removal allow the retina to resume its normal shape and improve vision. Image courtesy of the ©ASRS Retina Image Bank, contributed by Sharon Fekrat, MD, FACS. Image 1863. Figure 3c. 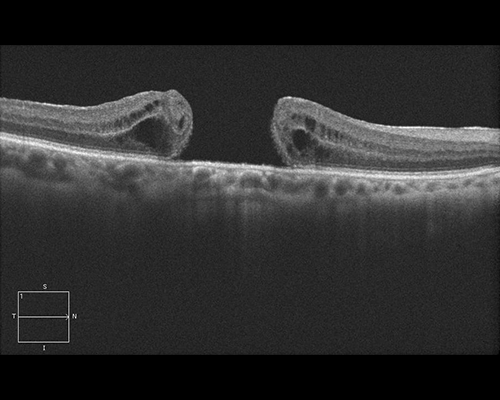 A full-thickness macular hole is shown using enhanced-depth imaging optical coherence tomography (EDI-OCT). The macula is pulled apart by traction on the surface of the retina. The dark areas represent swelling (retinal edema) from tissue damage. Vitrectomy surgery removes this traction and allows the retina to slide together, closing the gap and restoring the “hole” in the patient’s vision. Image courtesy of the ©ASRS Retina Image Bank, contributed by Mr. Jason Calhoun. Image 7267. Figure 3f. A fragment of metal (upper photo) punctures the eye and impales (pierces) the retina near the optic nerve. 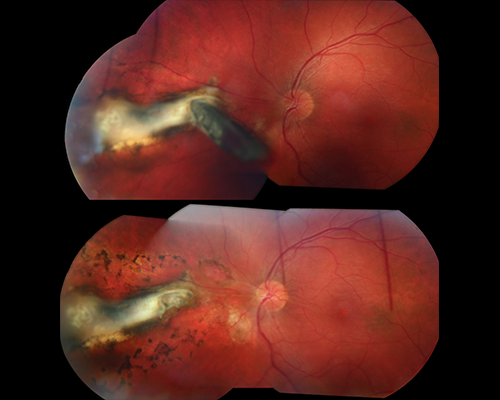 Vitrectomy surgery was performed to remove the intraocular (in-the-eye) foreign body and laser was placed to prevent retinal detachment (black spots surrounding the white scar in lower photo). Image courtesy of the ©ASRS Retina Image Bank, contributed by Ahmad Tarabishy, MD. Image 24834. Figure 3g. 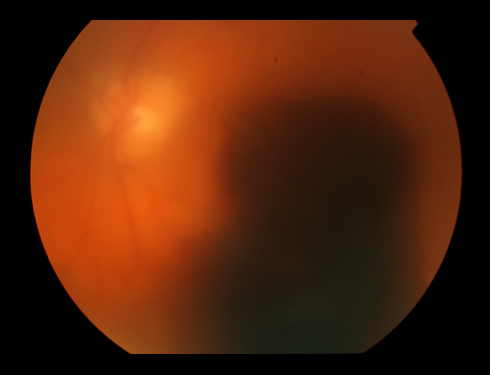 Traction retinal detachment involving the macula in retinopathy of prematurity (ROP) (Stage 4b ROP). Contracture of abnormal blood vessels forms an elevated ridge of scar tissue in an infant with severe prematurity. Image courtesy of ©ASRS Retina Image Bank, contributed by Audina Berrocal, MD. Image 1198. Sometimes in eyes with retinal detachment, vitrectomy is combined with scleral buckling, a procedure involving sewing a piece of silicone sponge, rubber, or semi-hard plastic onto the sclera or placing a band encircling the eye to relieve retinal traction. Performing vitrectomy in eyes that are disordered from trauma (Figure 3f) or in severely premature infants with retinopathy of prematurity (Figure 3g) can be very challenging. These are some of the most complex surgical procedures in all of ophthalmology. As noted previously, the vitreous humor and traction on the retina can cause a wide variety of problems. For this reason, vitrectomy is also performed to prevent complications or to improve the outcome of the primary surgery. For example, during anterior-segment surgery (cataract, glaucoma, cornea, intraocular [in-the-eye] lens), sometimes vitreous comes forward through the pupil and an anterior vitrectomy is performed. Similarly, when a cataract fragment, intraocular lens, or other foreign body dislocates and falls back into the vitreous, a vitrectomy is performed to fully free the object, which can then be removed or repositioned. 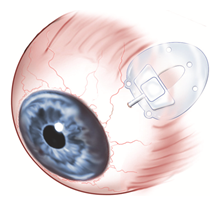 A pars plana seton (valve) inserted into the pars plana to control the intraocular pressure in an eye with glaucoma. A vitrectomy sometimes is performed as part of placing a pars plana glaucoma implant (see illustration). This device lowers eye pressure by allowing excess fluid to escape the eye. A vitrectomy removes the vitreous that might otherwise plug the drainage tube. In each example, a vitrectomy improves the outcome of the procedure and reduces the likelihood of retinal tear, retinal detachment, macular edema (swelling), and other complications. This special indication for vitrectomy is employed when removing or sampling the vitreous is needed to help make a diagnosis. A diagnostic vitrectomy is performed in severe eye infections, when the eye is inflamed, and for certain kinds of cancer that can spread to the eye. 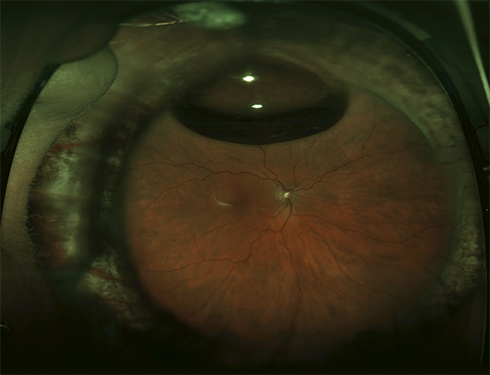 Examination of the vitreous helps ensure that the most appropriate treatment is being used. Vitrectomy is also performed when placing a therapeutic device in the eye. Devices may include extended-drug-delivery devices to deliver steroid or anti-viral drugs, a glaucoma drainage device (Figure 3h), a retinal prosthesis, and gene therapy where the therapeutic products are placed under the retina. New technologies offer the promise of directed treatment to the retina. Vitrectomy may be one way to accomplish this. Prior to surgery, your doctor will carefully examine your eye and assess your general health. 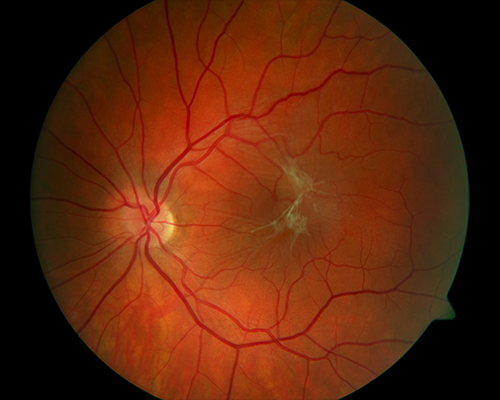 This typically involves a careful slit-lamp, dilated eye exam, and in-office testing such as OCT (ocular coherence tomography), fluorescein angiography, retinal photography, and/or ultrasound. Other tests may be performed if the surgery is likely to involve the anterior (front) segment, cornea, or lens. If the eye has been damaged by traumatic injury, CT scanning, MRI, and other procedures may be needed to fully understand the extent of the injury. The goal is to stabilize any medical conditions, if possible, before surgery. Once the retinal or vitreous condition has been identified, you and your retina specialist will make a plan for how to proceed. The risks, benefits, and alternatives (including observation) will be discussed as part of the informed consent. By signing, you give permission to schedule and proceed with the surgery. It is very important to coordinate other medical activities such as dialysis, home care, and transportation both before and after your surgery date. You should anticipate a return visit on the day after surgery to evaluate your condition. Typically, patients are asked to be “NPO” (nothing by mouth) 8 hours before surgery. Sometimes you will be told “nothing by mouth after midnight,” but this depends on the start time of surgery. Although your surgery may be later in the day, one reason to adhere to the “nothing by mouth after midnight” guideline is so your surgeon can move your case up in the schedule if there is an unexpected cancellation. Patients are also asked to be NPO so if vomiting occurs, stomach contents are less likely to get into the windpipe and lodge in the lungs. Your physician and anesthesiology team will advise you whether to continue with medications on the day of surgery. In general, patients taking eye drops may continue even on the day of surgery. However, pills and other oral medications will need specific direction. If medication is critical for the heart, breathing, blood pressure, seizures, or anxiety, these likely will be continued with a teaspoon of water. In the case of insulin, blood thinners, pacemakers, or other critical devices, each physician and anesthesiology team will inform you of their recommendations. Other pills, such as vitamins, cholesterol-lowering, or birth control pills, can probably wait until after surgery to resume. It is always advisable to come earlier rather than to be late to surgery. You may have to wait if other surgery cases take longer than expected, but it is better to arrive and rest than to rush and feel anxious. After checking in, you will be assigned an identification (ID) band. It is the first step in making sure you are the right patient, having the right surgery, on the correct eye. In the pre-operative area, nursing, anesthesia, and surgical staff will again confirm your procedure; they will also ask about your allergies, and confirm that you are in stable health to proceed. Before a marking pen is used to identify the eye to undergo surgery, you will be asked again to verbally confirm that the consent, chart, and scheduled surgery all match your expectation. If you are not sure, say so! You will be asked to change your clothes and to lie on a stretcher specially designed for eye surgery. Usually IV and EKG patches and an oxygen monitor will be placed to allow the team to give you medication for comfort and to keep track of your vital signs during surgery. Most adults have only minimal sedation to avoid side effects of general anesthesia, and because most patients are more comfortable with light relaxation. General anesthesia is usually reserved for children and severely injured, potentially unstable, or anxious individuals. Topical (eye drops) and periocular (around the eye) anesthesia are also typically given to make the eye comfortable and the surgery painless. As noted, most surgery is performed on an outpatient basis. The eye is generally comfortable, patched, and shielded to protect from injury. If a gas bubble or silicone oil has been used to treat the eye, your surgeon will give you instructions on how to do any required positioning (such as face-down), and how long you should continue it. The gas bubble serves to press the retina back into its normal position and hold it there until the eye heals. Because only light sedation is usually used, patients generally feel well and are ready to leave for home in an hour or less. You will need a driver because hospitals/surgical centers do not feel it is safe for you to drive immediately after surgery. When you return to the doctor’s office one day after surgery, it is advisable to have a driver to assist until your sight has returned enough to drive yourself. If a gas bubble has been used, air travel, use of nitrous gas anesthesia, and ascending to higher altitudes should be strictly avoided to reduce the risk of elevated eye pressure. Your doctor will give specific instructions on when you may resume these activities. Maintaining head and eye positioning after a vitrectomy involving a gas bubble or silicon oil is a very important way to contribute to the success of your eye surgery. When traveling as a passenger, you should have your eye or head turned as directed. You should always wear your seat belt when traveling. On your first post-operative visit, your doctor and her or his staff will review instructions for medications, drops, positioning, use of the eye patch, and general activities. You will also schedule your next follow-up appointment. You should NOT drive until you feel fully safe and capable of operating your vehicle; this can vary from a few days to several weeks following surgery. Surprisingly, a vitrectomy and removal of the vitreous has little effect on the health of the eye. The saline solution or gas bubble is gradually replaced by the eye’s own fluids (the aqueous humor). If silicone oil is used as a vitreous substitute to help more serious conditions heal, a second procedure may be performed several months after surgery to remove the silicone oil. There may be some temporary swelling of the eyelids, bruising around the eye, and redness following the surgery, but these improve relatively quickly. A mild sensation as if there is something in your eye is common following surgery, but severe pain is uncommon unless there is unusual inflammation or high eye pressure. Medicated eye drops are very important to help the eye heal. As with most medical conditions, the healthier the eye is before surgery, the more likely the eye will heal quickly and the vision will improve. Some patients will note a decrease in vision for a few days following the procedure. Others, particularly if a gas bubble or silicone oil is used, may need weeks or even months for the vision to improve. Severe complications are rare and anatomic success for vitrectomy is over 90% for many conditions. Advances in instrumentation, techniques, and understanding of diseases of the vitreous and retina have made vitrectomy and retina surgery more successful. Surgery for diseases that were once incurable, such as macular hole, is now routinely performed with excellent results. The list of indications for vitreous surgery continues to grow. The ability to directly work on or near the retina holds great promise for the future, not only to prevent vision loss, but to restore and enhance our ability to see.